Are You Ready for Pruning Season? It's February and it's time for Spring Pruning! Pruning is a major event which requires a more skilled hand than that of the generalized cutback we do in December. Our focus is on cutting out dead and diseased canes, and removing spindly or unthrifty growth. By reducing the overall size of the plant, we're maintaining a desired shape of the bushes. This level of pruning allows for a strong foundation from which the bush will produce its new growth when spring arrives. For certain (everblooming) climbing roses, the hard pruning may have been completed already, but for spring-only bloomers, we wait until after the bloom cycle is complete in order to properly prune it. Happy pruning! What Do I Need to Prune? 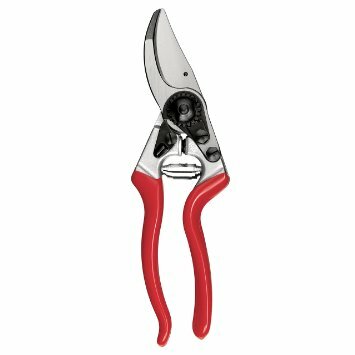 Before you even step outside, make sure your pruners are free of rust and burrs. Sharpen them with tool sharpener and clean off the rust with a multi purpose lubrication oil. If your pruners have been neglected for a few seasons, you may need to replace the blade or get them professionaly cleaned and sharpened at Witherspoon. By keeping your pruners sharpened you will put less strain on your body and reduce the risk of accidents. Most pruning accidents happen when the gardener is fighting the tool. Rose gardeners know that you will occasionally have to pull a thorn or two or a million out of your hands and arms legs body etc. However, there are gloves out there that will make pruning season easier on your hands and arms. Gauntlet gloves not only protect your hands, they also cover your forearms. Trust me, when you are reaching into the center of your Falling in Love rose bush to prune, you will want these gloves! Imagine this senario. You have just pruned your entire rose garden only to turn around and see piles of thorny clippings waiting to be picked up and hauled away. If only you had thought to contain the clippings as you pruned! Having a heavy duty waste bag will save you from the heartache of cleaning up an entire gardens worth of clippings from off the ground. Click Here to Print Witherspoon's Free Pruning Checklist!